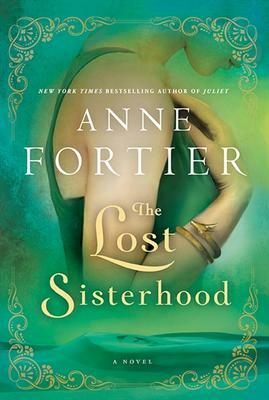 The evening starts at 6pm with dinner, followed by the author presentations and book signing. Attendees must reserve their spot at the bookstore with a non-refundable deposit of $20.00 which will go towards the cost of the meal (a set menu with a vegetarian option). The total cost of the meal is $37.50, which includes a three course meal (family-style). No substitutions will be allowed. Tax, 18% gratuity, and refreshments are not included. Tammie Winsor, author of “Jack and the Fairy Dogmother” will be at the Bookstore on Saturday May 10th at 10.00.-10.30a.m. to read stories to children. All welcome. This is an impressive tribute to a gentle Canadian woman who brought the joy of reading to a generation of African children. The writer is Deborah Cowley, based in Ottawa, with wide international experience as broadcaster and author. 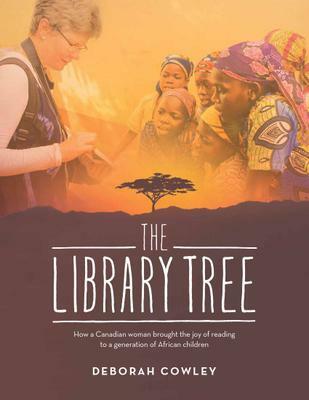 In The Library Tree she is writing about Kathy Knowles and describes how she was living with her husband John (both from Toronto) and their three children in l990, when a job offer came from Ghana for an accountant to a Canadian-owned gold mining company. Ghana had returned to relative calmness after a turbulent time following independence from Britain. The Knowles set off, Kathy expecting her fourth child. They arrived in the capital, Accra, and got settled with a good staff. Kathy liked to sit in the garden under a scarlet Flamboyant tree and read storybooks to her children. Very soon friends of the children crept into the garden too. They had never seen storybooks and were bewitched. Very soon some 70 were coming. Kathy and John decided to turn their spare bedroom into a tiny library to be called the Osu Library, after the name of their street. From this beginning, the book tells how Kathy negotiated with school and city officials to buy an empty shipping container, and so the library grew. Volunteers from Canada sent more and more books and the children slowly learned to read. After four years years in Ghana, the Knowles family returned to Canada, to live in Winnipeg. In l994 Kathy was back in Ghana checking on the libraries and pleased the way they had caught on. Deborah Cowley is a free-lance journalist with wide international experience, based in Ottawa. She had heard of Kathy Knowles’ work and in 2000 had an assignment from “Readers Digest” and flew to Accra. By that time, Kathy was going to Ghana twice a year for five weeks. She met Cowley who would continue her connection and by 20l2 had made fifteen trips to Ghana. She visited the libraries, which grew in number, watched the children greeting Madam Katty with songs, poems, bunches of flowers. She saw the first community centres built, larger than the early libraries, with a stage for plays and drums for concerts. She also saw Kathy writing a series of storybooks about Africa which are now widely published and distributed to the libraries. This book has good photographs of this modest, but very effective, story. As the weather finally improves, the bookstore traffic increases. Our business is quite weather dependent. We added a new feature recently-a bookcase full of Bargain books ($8 each; 3 for $20) from Penguin that we bought as a skid-load sight unseen. There is a fascinating mix of subjects that goes beyond our usual specialities. It’s well worth a browse. 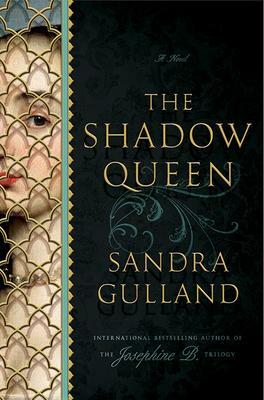 Maybe you need the latest translation of Beowulf or to re-read Victor Hugo or, in my case, the classic travel tale of Wilfred Thesinger- “The Marsh Arabs” or an Elizabeth George mystery in hardback. Take a look! On my vacation, I indulged in a feast of murder mysteries. It included police procedurals set in Brazil, South Africa and Sweden as well as Canadian novels set in Newfoundland, PEI and the Kootenays. It made me speculate about how popular mystery writing has evolved in parallel with the economic and political trends towards both globalisation and regionalisation. A couple of generations ago, the settings of mysteries were pretty much limited to those of the Agatha Christie style often set in an English country house or the gritty police dramas of New York City and with translations of Georges Simenon’s Inspector Maigret for something more exotic. Now we have dramas from around the world-from Singapore to Iceland-all giving us lots of local colour and culture and very often with detailed descriptions of local cuisine enjoyed by the main characters. However, parallel with this global expansion, there has been a strong regionalisation. Settings in England will feature Derbyshire or Yorkshire or Cornwall. These come with descriptions of local character and scenery. Very often, a description will be given of who is drinking which local beer. A pint of Theakstone’s best bitter can tell you a lot about a man’s character. Regional novels abound in Scotland and Ireland too. In Sweden, the setting is likely to be regional and the local feelings about Stockholm get an airing. (Nevertheless, the Swedish central characters almost all share a gloomy and depressed outlook no matter the region). Canada has seen an explosion of mystery writing from coast to coast with lots of local flavour. It would be fun to map them all(my next project?). Are there similarly mysteries in the French Language set in Canada? For Quebec, in English, we do have the brilliant Louise Penney series set in the Eastern Townships. Ottawa is very strong. Notably there are the Barbara Fradkin books featuring Inspector Green and Detective Brian Sullivan. Just recently we were involved with the very successful launch of Brenda Chapman’s “Cold Mourning” which dominated our March best-seller list. The March best seller list (see below) had some surprises. Joseph Boyden’s “Orenda” is still near the top and Charlotte Gray’s “The Massey Murder” is still there at #19. Very welcome on the list is a set of kids classics lead by “Alexander and the Terrible Horrible no good, very bad day” originally published in 1972. These were the result of some corporate purchases. A new addition is the novel “The Little Old Lady who broke all the Rules” by Catherina Ingelman-Sundberg. The original Swedish version sold about 1.2 million copies-about one copy for every three households. Expect to hear more about this. We have begun our Teen Reads book reviews. The first is of “Falling Kingdoms” by Morgan Rhodes, reviewed enthusiastically by Sarah Graves of Henry Larsen Public School. Good input for parents & grandparents as well as for teens. We are working on a follow-up to the Books n. Brew series but in a different location. An event is being planned for Sunday May 25th with advance ticket purchase necessary. Full details will be out shortly. Note that we are closed on Good Friday April 18th. 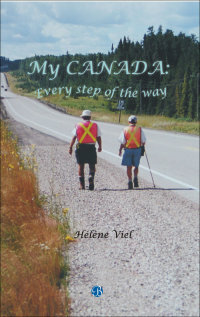 Local author Helene Viel will be in the store on Saturday, April 12 to sign copies of her new book My Canada: Every Step of the Way from 11:00am to 1:00pm. “A story of endurance and dreams fulfilled. After a decade of planning and dreaming, Helene Viel from Riviere-du-Loup, Quebec, and her husband Ole Olson from Broadview, Saskatchewan, marked their retirement by walking across Canada, from the Arctic Ocean to the Pacific to the Atlantic. We hope to see you all on Saturday! Another trip to the north of Scotland in M.C. Beaton’s “Death of Yesterday”. In the Hamish MacBeth story there are three murders this time. But they slip into the everyday life of the beloved constable. We end up just as interested in his pets, one wild cat, a dog and some hens and his gently shifting home life as we are in the odd facts that make up the murders. 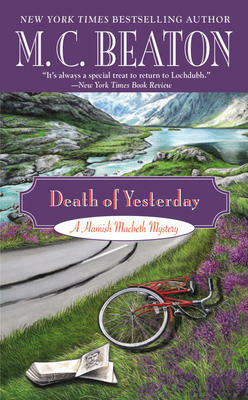 Hamish MacBeth has already had plenty of success with solving murders in his career. But for him, he is so fond of his life in a small charming Scottish village that he does not want to be promoted and moved to a bigger industrial centre! Beaton makes his village of Lochdubh so loveable that all his readers know exactly how he feels. This readership has expanded to include a huge collection of addicts in the United States. Like all the Hamish MacBeth stories, this book shows why. This is an exhilarating book to read and gives an insight into our planet that we haven’t had from radio or television shows to date. The reason is Chris Hadfield’s wit and eloquence in describing his incredible adventures. 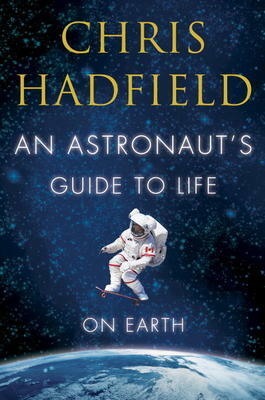 Hadfield is world famous as the recent Commander of the International Space Station. He conducted a record-setting number of scientific experiments and oversaw an emergency spacewalk. He also took some amazing photographs and videos about life in space, some of the photos are in this book. Hadfield was 9 years old on July 20, 1969 when he watched the Apollo moon landing from his family’s cottage in Ontario. He knew then that he wanted to be an astronaut. He also knew that Canadians couldn’t even apply for the job; we didn’t have a space agency. And so this is the story of his gradual training, with basic jet training with the Canadian Forces, then the U.S. Air Force Test Pilot School in California in 1988. In 1991 Canada had its own space agency which took out an ad in the newspaper: Wanted: Astronauts. There were 5,329 applications and Hadfield won. The rest of the book describes his learning career. He ran 25 Shuttle launches and also served as Director of NASA Operations in Star City, Russia from 2001-2003. He made two close Russian friends and the book vividly describes the small Soyuz capsule in which they spent five months on the International Space Station before returning to Earth. Hadfield had a very happy marriage and three children. He talks about his philosophy, i.e. anticipating problems and figuring out how to solve them which he claims is the opposite of worrying: it’s productive. It certainly has been for him and this book is a generous way of sharing this.